Build a Quick, Affordable Shelter! 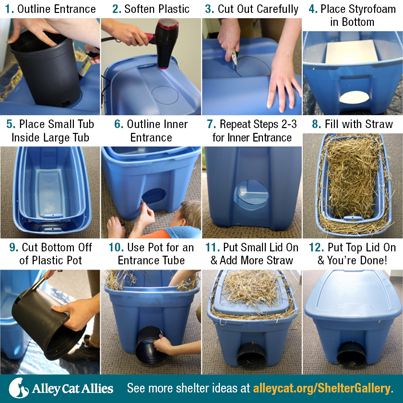 Providing shelter is a great way to keep cats safe from the elements and can help you monitor their ongoing well-being. There are several options available for feral cat shelters. Below are just some of those options. Learn what makes a good shelter for outdoor cats. 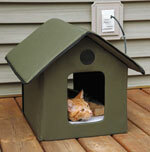 Looking for other ways to keep cats more comfortable outdoors? See our tips for winter, summer, and year-round care. Special thanks to Drs. Fosters and Smith. Possible Drawbacks: Cost, may not accommodate more than one cat. Advantages: Lightweight, protects from the elements. Possible Drawbacks: Cost, not well insulated, complaints about cracking in outer plastic. Special thanks to Modern Cat. Advantages: Made from recycled materials, weatherproof, insulated, removable lid, easily cleanable, and comes with a "straw only" option. Possible Drawbacks: Cost, the pet bed option is not recommended for outdoor use. Special thanks to The Kitty Tube.. Advantages: Sturdy wooden construction, spacious, available with add-ons such as insulation, another exit, door flaps and overhangs, and risers. Possible Drawbacks: We don't recommend some of the bedding options such as cedar and pine shavings. The base price is reasonable, but once you include add-ons, it can get pricey! Special thanks to Ark Workshop. Advantages: Durable wood and weatherproof shingles. Possible Drawbacks: Requires some tools for construction. *Check out the pre-made feeding stations available for purchase on the same site. Special Thanks to Feral Villa. Advantages: Pre-made and can be purchased at most pet stores. Possible Drawbacks: Wide door opening makes this shelter harder to insulate and guard against the wind. This also provides less protection from predators. Advantages: Styrofoam cooler is available from hardware stores, grocery stores, restaurants, etc. Simple to make. Possible Drawbacks: Lightweight - provides less protection from predators than a wooden structure. Cats may scratch styrofoam. As with many of our low cost shelter options, this shelter is not weatherproof, and will require more upkeep then some of the more permanent and professionally built shelters. Try reinforcing this shelter by taping heavy duty lawn and garbage bags around the outside of it, to provide added protection from rain and snow. Special Thanks to Indy Feral. Advantages: Available in white or camouflage, tiled floor to prevent scratches, drainage system. Possible Drawbacks: Lightweight - provides less protection from predators than a wooden structure. Special Thanks to All About Spay Neuter. Advantages: Inexpensive, easy to build and transport. Special Thanks to Spay And Stay. Special Thanks to Community Cats Maryland. Advantages: Pressure sealed, 2 insulations all around, low maintenance. Advantages: Affordable, easily reproduced in quantity with commonly available materials and simple tools. Possible Drawbacks: Provides less protection from predators than a wooden structure. Advantages: Affordable, door flap to help keep out weather, easily reproduced in quantity with commonly available materials and simple tools. Special Thanks to Dana Hudson Goldstein from VoteAnimals.org. Special Thanks to John V.
Advantages: Weather proof, pre-insulated, relatively inexpensive and includes an easy opening top for cleaning. Possible Drawbacks: Requires special tools for cutting an opening. Advantages: Available at most home improvement stores and garden centers, well camouflaged. Possible Drawbacks: Prefabricated rocks can be expensive, tools will be necessary to cut opening and attach base. Special Thanks to CSUN Catpeople. Advantages: Stylish and well designed. Simple, inexpensive, durable materials. Weather resistant. Variety of designs that can be easily modified. 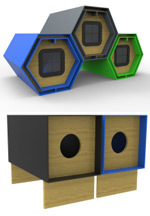 Some designs can be attached together to create multi-unit shelters. Possible Drawbacks: Requires some degree of skill and access to tools—like a jigsaw for cutting. Not all design plans are complete—the site is a work in progress—so check back for updates. Special Thanks to Chris Peterson. Advantages: Sturdy design, can house multiple cats, provides protection from predators. Possible Drawbacks: Building requires a moderate degree of skill. Advantages: Sturdy design, provides protection from predators. Advantages: Very sturdy, two exits, raised for potential high snowfall, can use water-resistant/proof material for roofing, small “porch” on front. Possible Drawbacks: Requires tools for construction, cost, larger size. Special Thanks to FIVER Cats. Advantages: Can house 10-15 cats, camper toppers are readily available for purchase. Possible Drawbacks: Requires some tools and moderate skill for modification. Special Thanks to Friends of Felines in Sedgwick, Kansas. Advantages: Shed is easily re-purposed and modified. Houses many cats and provides heating options. Possible Drawbacks: Requires larger space, availability of a shed, and moderate skill to install a cat door. Advantages: Easy to install, provides protection from predators and its intended purpose is not noticeable. Possible Drawbacks: Moderate skill level required to frame and apply lattice. 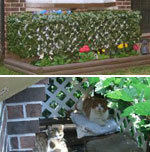 Advantages: Accomodates more than one cat, inexpensive and easy to construct, provides privacy for cats and aesthetic consideration for neighbors. Possible Drawbacks: Not weatherproof, requires additional measures for cold weather use. Special Thanks to Ellen Hart. 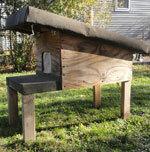 Advantages: Sturdy design, provides protection from predators, large A-fram roof allows for heat lamp. Possible Drawbacks: Building requires a high degree of skill. Advantages: Houses multiple cats, sturdy, offers protection from predators. Possible Drawbacks: Requires skill, and large space.